Prophet in the days of Jeroboam II. ; son of Amittai of Gath-hepher. He is a historical personage; for, according to II Kings xiv. 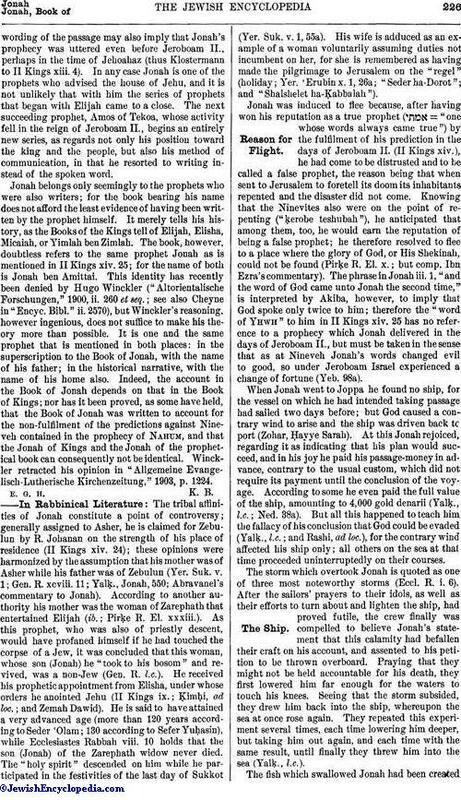 25, he predicted in Yhwh's name the extent to which Jeroboam II. would restore the boundaries of the Northern Kingdom, "from the entering of Hamath unto the sea of the plain." Thewording of the passage may also imply that Jonah's prophecy was uttered even before Jeroboam II., perhaps in the time of Jehoahaz (thus Klostermann to II Kings xiii. 4). In any case Jonah is one of the prophets who advised the house of Jehu, and it is not unlikely that with him the series of prophets that began with Elijah came to a close. The next succeeding prophet, Amos of Tekoa, whose activity fell in the reign of Jeroboam II., begins an entirely new series, as regards not only his position toward the king and the people, but also his method of communication, in that he resorted to writing instead of the spoken word. Jonah belongs only seemingly to the prophets who were also writers; for the book bearing his name does not afford the least evidence of having been written by the prophet himself. It merely tells his history, as the Books of the Kings tell of Elijah, Elisha, Micaiah, or Yimlah ben Zimlah. The book, however, doubtless refers to the same prophet Jonah as is mentioned in II Kings xiv. 25; for the name of both is Jonah ben Amittai. This identity has recently been denied by Hugo Winckler ("Altorientalische Forschungen," 1900, ii. 260 et seq. ; see also Cheyne in "Encyc. Bibl." ii. 2570), but Winckler's reasoning, however ingenious, does not suffice to make his theory more than possible. It is one and the same prophet that is mentioned in both places: in the superscription to the Book of Jonah, with the name of his father; in the historical narrative, with the name of his home also. Indeed, the account in the Book of Jonah depends on that in the Book of Kings; nor has it been proved, as some have held, that the Book of Jonah was written to account for the non-fulfilment of the predictions against Nineveh contained in the prophecy of Nahum, and that the Jonah of Kings and the Jonah of the prophetical book can consequently not be identical. Winckler retracted his opinion in "Allgemeine Evangelisch-Lutherische Kirchenzeitung," 1903, p. 1224. 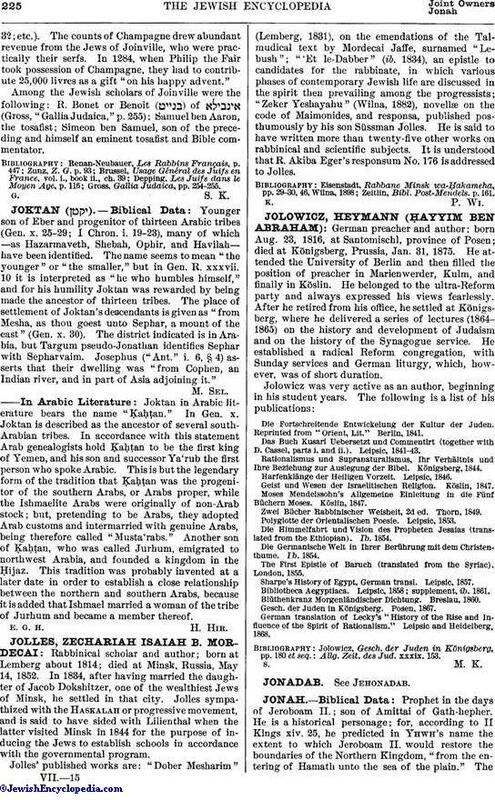 The tribal affinities of Jonah constitute a point of controversy; generally assigned to Asher, he is claimed for Zebulun by R. Johanan on the strength of his place of residence (II Kings xiv. 24); these opinions were harmonized by the assumption that his mother was of Asher while his father was of Zebulun (Yer. Suk. v. 1; Gen. R. xcviii. 11; Yalḳ., Jonah, 550; Abravanel's commentary to Jonah). According to another authority his mother was the woman of Zarephath that entertained Elijah (ib. ; Pirḳe R. El. xxxiii.). As this prophet, who was also of priestly descent, would have profaned himself if he had touched the corpse of a Jew, it was concluded that this woman, whose son (Jonah) he "took to his bosom" and revived, was a non-Jew (Gen. R. l.c.). He received his prophetic appointment from Elisha, under whose orders he anointed Jehu (II Kings ix. ; Ḳimḥhi, ad loc. ; and Ẓemaḥ Dawid). He is said to have attained a very advanced age (more than 120 years according to Seder 'Olam; 130 according to Sefer Yuḥasin), while Ecclesiastes Rabbah viii. 10 holds that the son (Jonah) of the Zarephath widow never died. The "holy spirit" descended on him while he participated in the festivities of the last day of Sukkot (Yer. Suk. v. 1, 55a). His wife is adduced as an example of a woman voluntarily assuming duties not incumbent on her, for she is remembered as having made the pilgrimage to Jerusalem on the "regel" (holiday; Yer. 'Erubin x. 1, 26a; "Seder ha-Dorot"; and "Shalshelet ha-Ḳabbalah"). Jonah was induced to flee because, after having won his reputation as a true prophet ( = "one whose words always came true") by the fulfilment of his prediction in the days of Jeroboam II. (II Kings xiv. ), he had come to be distrusted and to be called a false prophet, the reason being that when sent to Jerusalem to foretell its doom its inhabitants repented and the disaster did not come. Knowing that the Ninevites also were on the point of repenting ("ḳerobe teshubah"), he anticipated that among them, too, he would earn the reputation of being a false prophet; he therefore resolved to flee to a place where the glory of God, or His Shekinah, could not be found (Pirḳe R. El. x.; but comp. Ibn Ezra's commentary). The phrase in Jonah iii. 1, "and the word of God came unto Jonah the second time," is interpreted by Akiba, however, to imply that God spoke only twice to him; therefore the "word of Yhwh" to him in II Kings xiv. 25 has no reference to a prophecy which Jonah delivered in the days of Jeroboam II., but must be taken in the sense that as at Nineveh Jonah's words changed evil to good, so under Jeroboam Israel experienced a change of fortune (Yeb. 98a). When Jonah went to Joppa he found no ship, for the vessel on which he had intended taking passage had sailed two days before; but God caused a contrary wind to arise and the ship was driven back to port (Zohar, Ḥayye Sarah). At this Jonah rejoiced, regarding it as indicating that his plan would succeed, and in his joy he paid his passage-money in advance, contrary to the usual custom, which did not require its payment until the conclusion of the voyage. According to some he even paid the full value of the ship, amounting to 4,000 gold denarii (Yalḳ., l.c. ; Ned. 38a). But all this happened to teach him the fallacy of his conclusion that God could be evaded (Yalḳ., l.c. ; and Rashi, ad loc. ), for the contrary wind affected his ship only; all others on the sea at that time proceeded uninterruptedly on their courses. The storm which overtook Jonah is quoted as one of three most noteworthy storms (Eccl. R. i. 6). After the sailors' prayers to their idols, as well as their efforts to turn about and lighten the ship, had proved futile, the crew finally was compelled to believe Jonah's statement that this calamity had befallen their craft on his account, and assented to his petition to be thrown overboard. Praying that they might not be held accountable for his death, they first lowered him far enough for the waters to touch his knees. Seeing that the storm subsided, they drew him back into the ship, whereupon the sea at once rose again. They repeated this experiment several times, each time lowering him deeper, but taking him out again, and each time with the same result, until finally they threw him into the sea (Yalḳ., l.c.). The fish which swallowed Jonah had been createdin the very beginning of the world in order to perform this work (Zohar, Wayaḳhel; Pirḳe R. El. x.; see also Gen. R. v. 5). Therefore this fish had so large a mouth and throat that Jonah found it as easy to pass into its belly as he would have found it to enter the portals of a very large synagogue (ib.). It had eyes which were as large as windows, and lamps lit up its interior. According to another opinion, a great pearl suspended in the entrails of the fish enabled Jonah to see all that was in the sea and in the abyss. The fish informed Jonah that he was to be devoured by Leviathan. Jonah asked to be taken to the monster, when he would save both his own life and that of the fish. Meeting Leviathan, he exhibited the "seal of Abraham," whereupon the monster shot away a distance of two days. To reward him for this service the fish showed Jonah all the wondrous things in the ocean (e.g., the path of the Israelites across the Red Sea; the pillars upon which the earth rests). Thus he spent three days and three nights in the belly of the fish, but would not pray. God then resolved to put him into another fish where he would be less comfortable. A female fish quick with young approached the male fish in which Jonah was, threatening to devour both unless Jonah were transferred to her, and announcing her divine orders to that effect. Leviathan confirmed her story at the request of both fishes, and then Jonah was ejected from one fish into the over-filled belly of the other. Cramped for room and otherwise made miserable, Jonah finally prayed, acknowledging the futility of his efforts to escape from God (Ps. cxxxix.). But he was not answered until he had promised to redeem his pledge to capture Leviathan. As soon as God had his promise, He beckoned to the fish and it spat out Jonah upon the dry land, a distance of 968 parasangs. When the crew of the ship saw this they immediately threw away their idols, sailed back to Joppa, went to Jerusalem, and submitted to circumcision, becoming Jews (Yalḳ., l.c. ; Tan., Wayiḳra, ed. Stettin, 1865, pp. 370 et seq. ; see also Pirḳe R. El. x.). 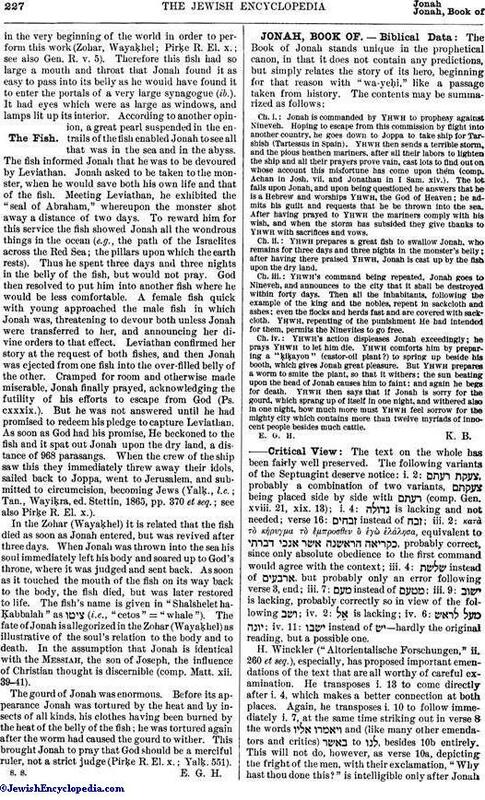 In the Zohar (Wayaḳhel) it is related that the fish died as soon as Jonah entered, but was revived after three days. When Jonah was thrown into the sea his soul immediately left his body and soared up to God's throne, where it was judged and sent back. As soon as it touched the mouth of the fish on its way back to the body, the fish died, but was later restored to life. The fish's name is given in "Shalshelet ha-Ḳabbalah" as (i.e., "cetos" = "whale"). The fate of Jonah is allegorized in the Zohar (Wayaḳhel) as illustrative of the soul's relation to the body and to death. In the assumption that Jonah is identical with the Messiah, the son of Joseph, the influence of Christian thought is discernible (comp. Matt. xii. 39-41). The gourd of Jonah was enormous. Before its appearance Jonah was tortured by the heat and by insects of all kinds, his clothes having been burned by the heat of the belly of the fish; he was tortured again after the worm had caused the gourd to wither. This brought Jonah to pray that God should be a merciful ruler, not a strict judge (Pirḳe R. El. x.; Yalḳ. 551).